2. Because I do not have time to reproduce the design, I stole the anti-clockwise side of the earrings and turned it into jewelry headband for my baby so that she could wear it for her cousin's birthday party. 3. I still haven't reproduce the anti-clockwise side of the earring, hence, I do not have a pair of earrings to show as of today. But request came in early. I have to let people know how does it look like when worn. So here it is. 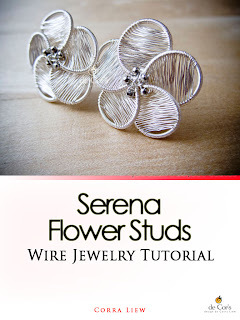 Serena Flower Studs Earrings, absolutely easy to be modified and made into jewelry headband, too. The anti-clockwise side of earring is now a jewelry headband. And it belongs to my little princess now. You are welcome! by the way would you drop me an email at decors.l@gmail.com please?